The new, unique roller heads with diamond crystals gently remove unwanted hard skin – leaving feet feeling silky smooth. The new diamond crystal rollers are now available in three different intensities: Extra Coarse for particularly thick and stubborn hard skin, and Regular Coarse for excess hard skin. Both exfoliate away hard, rough skin quickly and effectively. 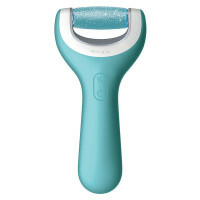 Meanwhile, the Soft Touch roller provides a perfect finish – for soft, beautiful skin. The roller heads couldn't be easier to swap in and out: simply press the button on the top of the unit to remove the roller. Then gently insert the new roller into the opening until you hear a click. The Express Pedi comes with a safety feature that locks the roller in the place if too much pressure is applied, preventing any injuries. The ergonomically designed handle is molded to fit the hand, making it extremely comfortable and pleasant to use. The Pedi Perfect™ Electronic Foot File takes four AA batteries. To replace the batteries, simply turn the screw cap on the end of the handle counter clockwise, remove it, insert the new batteries and then screw the cap back on. How to get your feet ready for the office party!